THIS BENGALI YOUNG MAN AT THE TRAIN STATION in Dhaka wanted his photo taken. BENGALI YOUNG LADY ON EKUSHI FEBRUARY. Don’t mess up the mascara! GIRLS FROM SUNSHINE ACADEMY IN DHAKA, Bangladesh among the throngs celebrating Ekushi February . 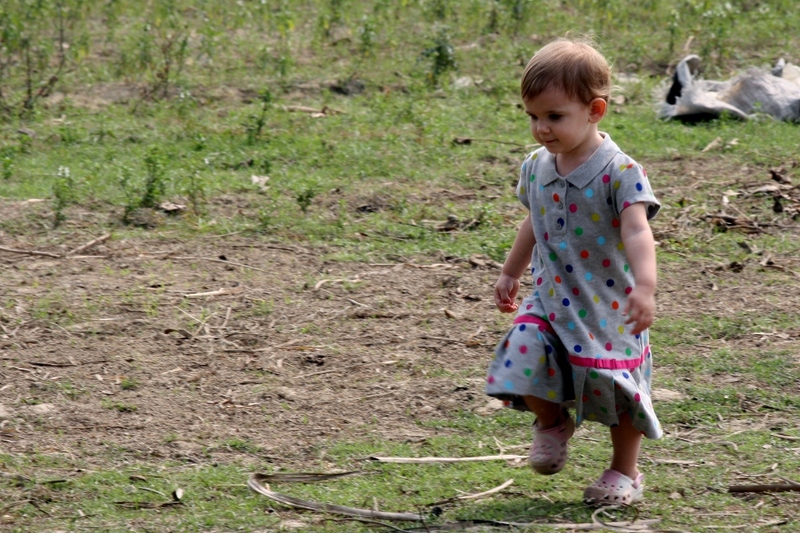 CHAYLA LOVIN’ THE COUNTRY AIR in a village near Manikganj, Bangladesh. ON EKUSHI FEBRUARY (Feb 21) holiday folks were out commemorating International Mother Tongue Language Day. Charles and his daughter, Candace were trying out hats. 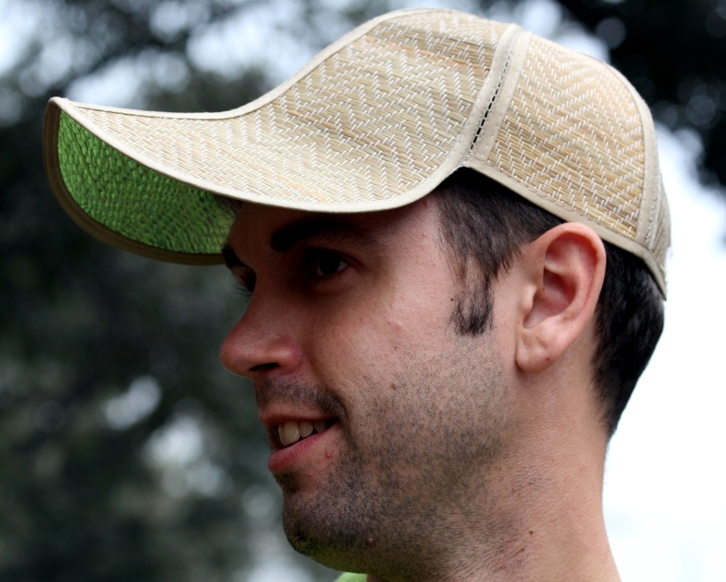 In reality Candace wanted a hat, and a cap salesman wanted Charles to have a cap! 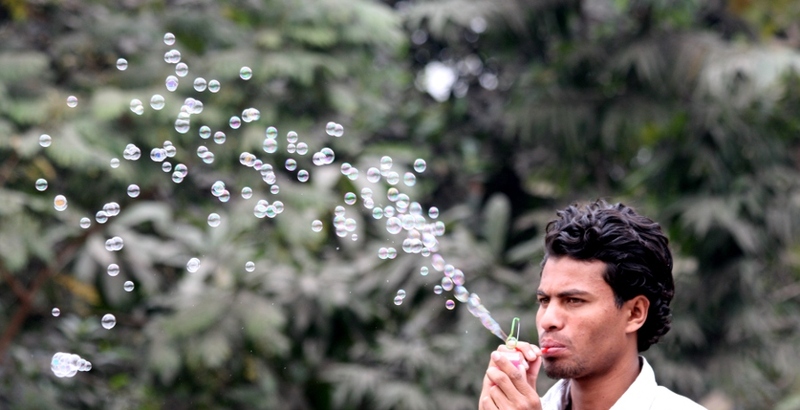 BENGALI MAN DEMONSTRATING WHAT his bubble blower can do! What child wouldn’t want one of these after seeing this demonstration. Near the Boi Mela (Book Fair) there were many vendors trying to sell their wares. EKUSHI FEBRUARY, AND INTERNATIONAL MOTHER LANGUAGE DAY! 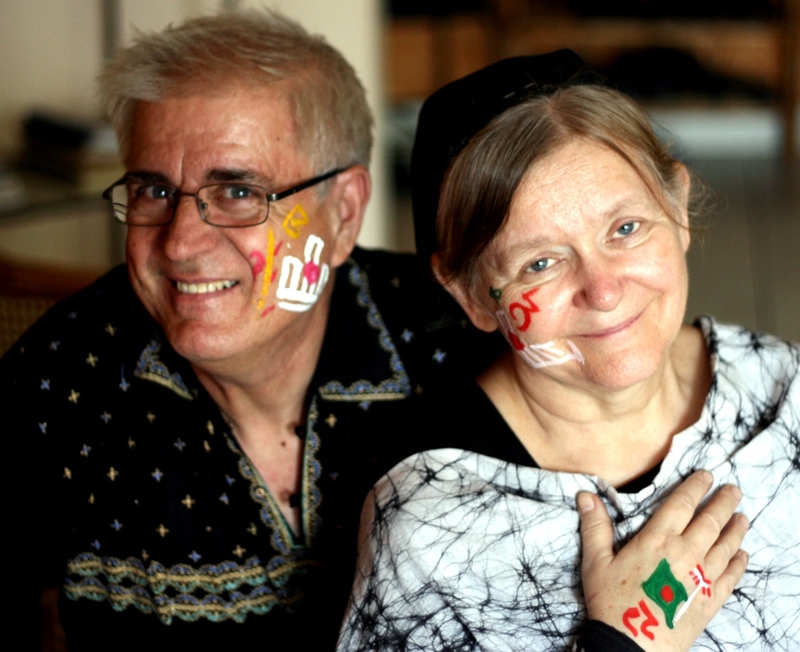 MY WIFE, ALICE, AND I HAD our faces painted which is a tradition on holidays. We both had the Shohid Minar (language martyrs memorial) painted on our faces and Alice had the Bangladesh national flag painted on her hand. This is the day in 1952 when some students were martyred who were protesting because Pakistan didn’t want Bangla as one of the national languages. At this time Alice and I were 3 1/2 years old. 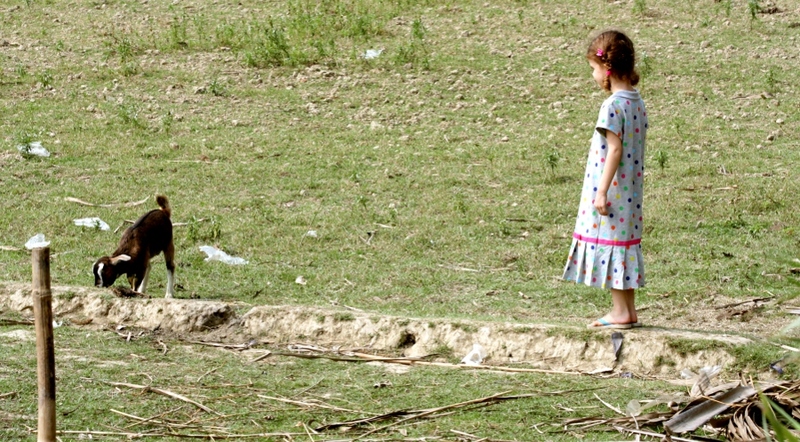 CANDACE FOX TAKING A CLOSE look at the goat in a village near Manikganj. She sure enjoyed getting out of the city. 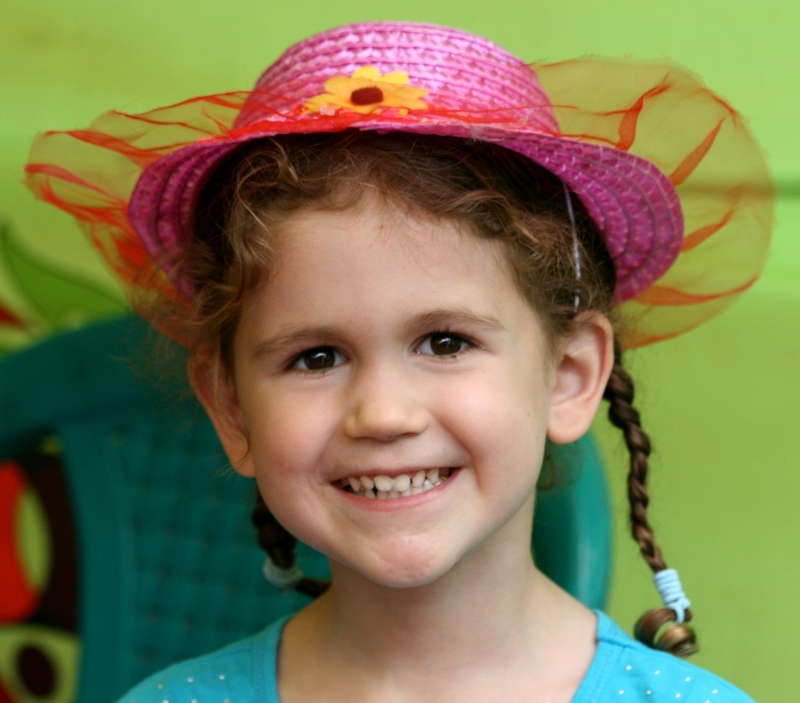 She was skipping and running whenever she had a chance! 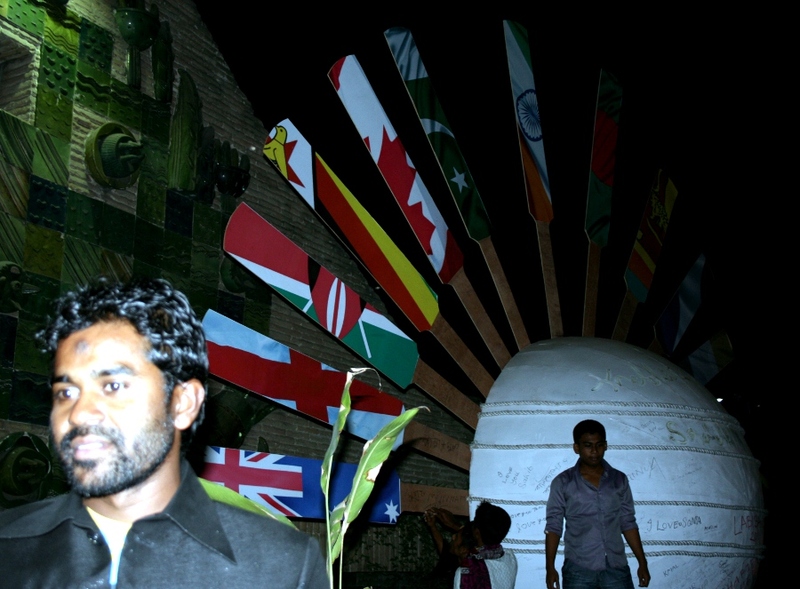 MY FRIEND HALIM STANDING IN FRONT OF ONE OF THE MANY STRUCTURES GREETING visitors entering Dhaka for the ICC World Cup Cricket 2011. It has parts of each of the 14 participating countries represented on a cricket bat. 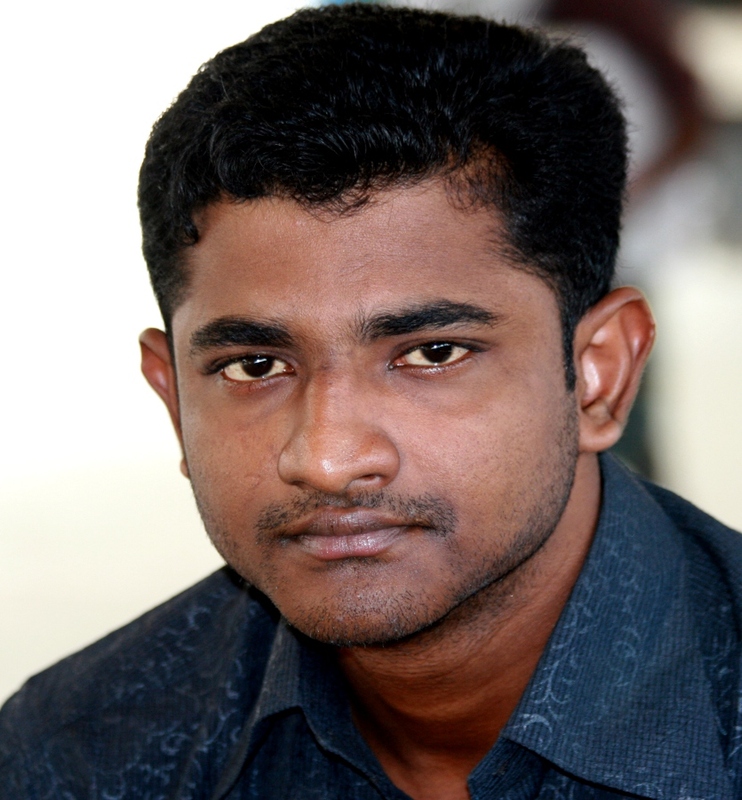 Today Bangladesh is playing India. For both teams this is almost as important as the finals. In a previous World Cup Bangladesh upset India and India is hoping for paybacks today. 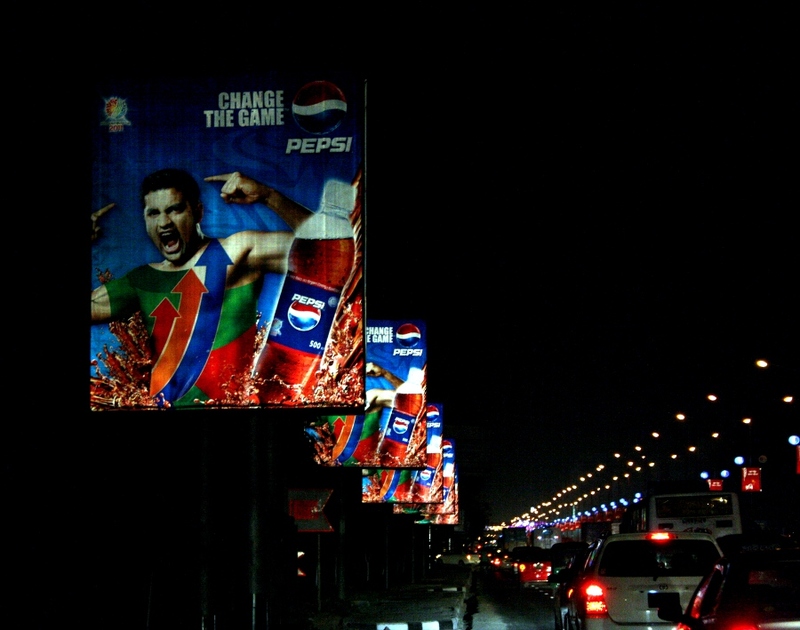 PEPSI GETTING INTO THE ACT with all these ads along the highway between the airport and the city. No question about it, anyone entering the city for the ICC World Cup Cricket 2011 will see these signs. Actually Diet Pepsi is one of my favorite drinks along with borhani (a must at every wedding celebration). SOMEWHAT OF A ‘WILD GOOSE CHASE!” Last evening my friend called and wondered if me and my camera could come to his place at 8:15 to be ready for departure at 8:30 pm to go with him and two friends of his to the airport. We didn’t get left in the CNG until 9 pm. I thought maybe he was meeting a friend at the airport, but soon realized it was to look at and take photos of the many lights in the city as it celebrates the ICC World Cup Cricket 2011. It reminded me of driving around the countryside during the Christmas and enjoying the lights. We arrived at the airport after at least an hour of travelling (waited for a train at two different locations). Halim had seen an ad for the World Cup on TV that showed the airport with a magnicent light display, but obviously it was only to greet the teams and not there for the duration of the event! He was disappointed. We did stop at several places to take photos. 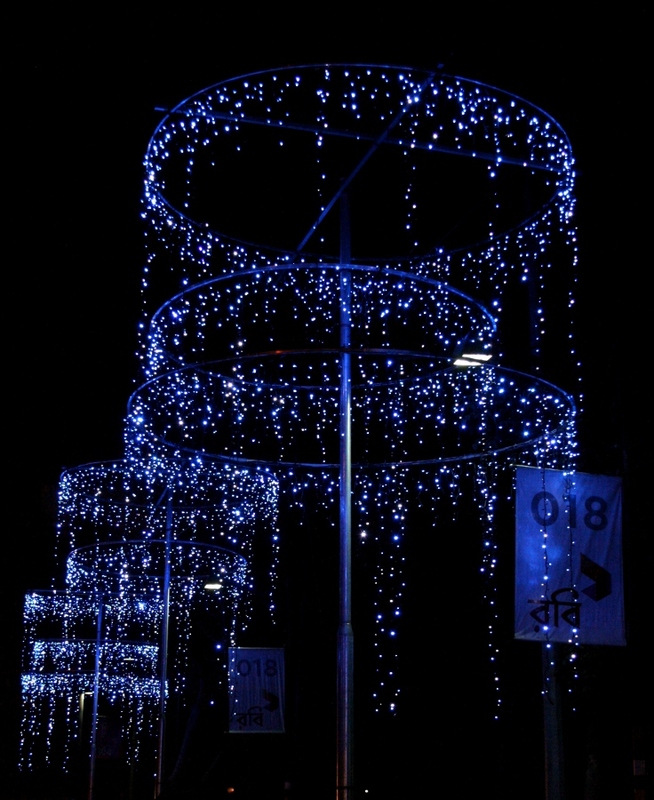 These are some of the lights that were along Airport Road. THE PROVATI SANGHA football I play with getting lined up and ready for their football match.